Hi all! We're trying to keep cool here, but it's not easy. All I have to say is I am VERY thankful for window air conditioners! I wanted to play along with the CAS challenge on Splitcoast this week, which is to use paper-piecing on a card. I've been playing around with this card since last week (you may recognize the Sweet Sunday Sketch Challenge #21), and I thought the paper-piecing added exactly what it needed! 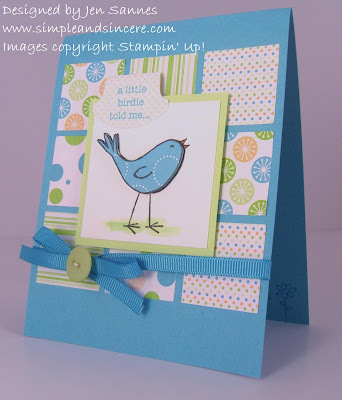 I used A Little Birdie Told Me (soon to be retired) to make this card, along with some of my Rainbow Sherbet dsp scraps. I also added some Tempting Turquoise grosgrain ribbon with a little button detail (love that bow with the button look - I've been seeing that all over lately). Thanks for stopping by! So sweet--I always forget to use that tab punch, and it works perfectly here! Love the colors too. This is adorable! I'm so glad that I ordered this when I did. I was surprised to hear that it was retiring.